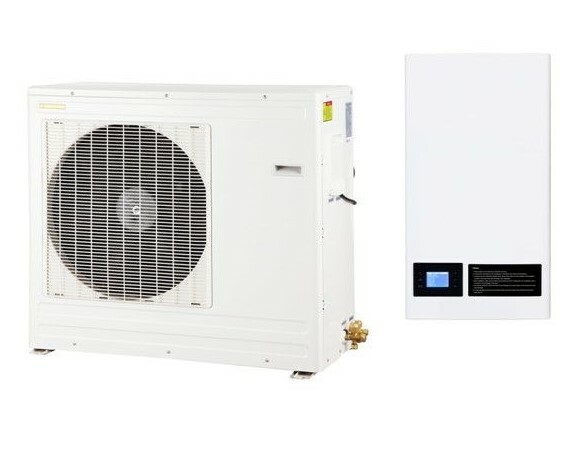 Weswen DC inverter heat pump is one of the best heat pumps for house heating so far, with advanced DC inverter technology, saving 40% electricity than normal on/off heat pump in practical operation. The whole system is optimized with variable fan speed, while the temperature compensation function contributes to a more comfortable indoor environment. It can work with solar, boiler or electric heater according to practical condition of the heating system. with Advanced DC inverter technology, it saves 40% energy than normal heat pump in practical operation. 5 modes to manage heating, cooling and DHW, fit your need all year round. With intelligent Heating curves (temperature compensation function), the water setting temperature adjusts automatically as the house’s heat loss changes. Automatically variable fan speed in 3 grades to optimize heating efficiency. Can work with room thermostat / master controller / solar controller. Can work with auxiliary heater. Split design with water system indoor, preventing water frozen problem. Aviation plug for wire connection between indoor unit and outdoor unit, simplifies installation and avoids mistakes. In indoor unit contains brazed plate heat exchanger, WILO circulation pump, expansion vessel, flow switch, water pressure gauge, air vent. Allows absence of buffer tank for heating/cooling.